We are now reaching the stage where we need to work on the main route through the village, the A431 Bath Road, in order to repair and, where possible, make improvements to the existing highway drainage systems. 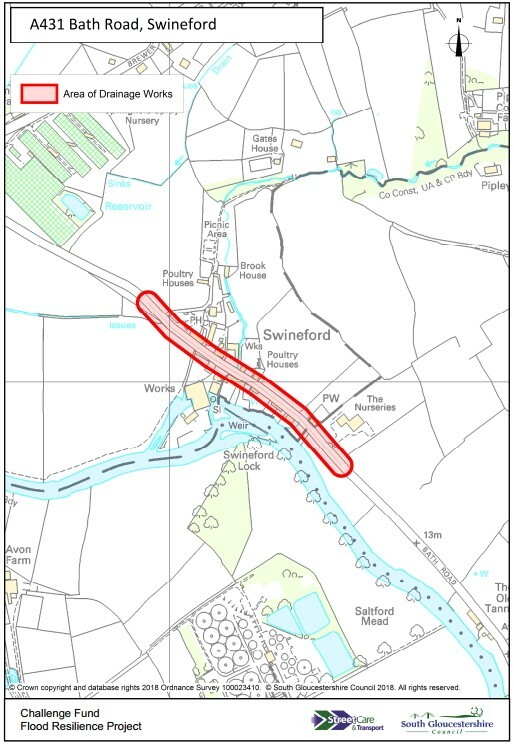 All works on the A431 though Swineford will be carried out under temporary traffic signal control and we do not anticipate major disruption in the area. We do not yet have a detailed programme of these works but anticipate they will begin in the summer period and take up to four weeks to complete. Bath Road, Swineford was selected as one of nine sites across South Gloucestershire as part of a wider £3.35million Government funded scheme to improve drainage and flood protection systems. We anticipate it will take a minimum of four weeks. We will provide updates for residents as we begin work on site. Members of the project team will be on hand to answer any questions about the work we are carrying out, the benefits it will bring, the temporary traffic management measures required and specifically the diversion routes for the road closures.